Our handcrafted work is created using a palette of vibrant colors, varied textures, and metallic finishes. Designs vary from themes based on overlapping geometric shapes to flowing, organic patterns. While these products are not for sale through this site, we invite you to peruse our photos to view examples of our artwork and visit the Shop tab to find our retail and art fair locations. Please feel free to contact us with any interest in custom work. Kathleen Kitch and her husband, Dana Goodman, are the founding artists of Glassroots. Kathleen began her career with the glass medium in 1978. After purchasing a few materials and tools she began experimenting, making small stained glass windows. The following year she began working in a commercial stained glass studio, where she expanded her knowledge and skills with the medium. In 1987 she and Dana opened their studio, Glassroots, and sold three-dimensional boxes, towers, and vases at art fairs and galleries. In 1991 Kathleen was introduced to a different process of working with glass, using a kiln to form fused glass. She began incorporating it into her stained glass and grew to love the more fluid way to design her work. She found that fusing offered greater possibilities and fewer limitations. 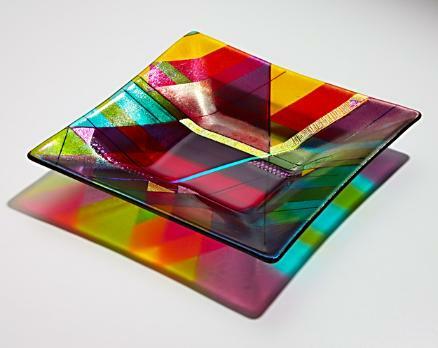 By 2000 she and Dana had transitioned to producing solely fused glass artwork. That year, along with 17 other women, Kathleen founded Artists' Own, a co-op art gallery in downtown Lafayette, Indiana. Glassroots studio is located at Dana and Kathleen's home overlooking Big Pine Creek in Warren County, Indiana. Out in the country they enjoy a life of creating glass artwork, growing organic produce, and revering the surrounding nature and community. Find us on Facebook! Click the 'like' button on the left to become a fan.